There is nothing better on a cold winter afternoon than cozying up with a great book and a hot cup of tea. So Sunday afternoons throughout January and February we are excerpts from some of our favorite novels from some of our favorite authors and matching them with wonderful tea. 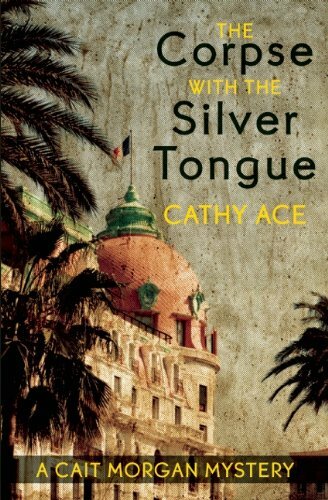 Today we have Cathy Ace joining us with an excerpt from The Corpse with the Silver Tongue. 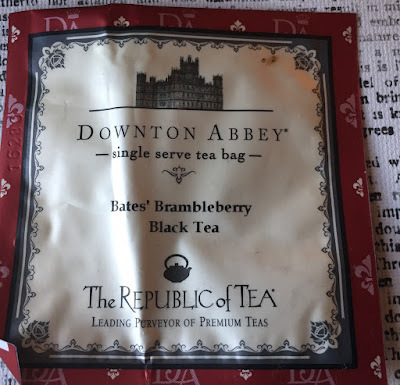 I have selected Bates' Brambleberry Black Tea to go with the Corpse with the Silver Tongue. Cathy is Welsh and lives in Canada, so this might be a case of an American (me) lumping together anything that is remotely close to being British together, but this just has the right feel for the book to me. And it's delicious. at the dinner table” is not tackled in any modern etiquette books. attention-seeking show for us all. upon the rest of the group. so I have a pretty good idea of what constitutes “odd” under these circumstances. in her hand, which she proceeded to waggle around her late husband’s body. open windows with the smoking twigs. See what I mean? red-roofed Old Nice below us and the glittering Mediterranean beyond. from experience that at such a time someone has to take charge. French police would automatically show up along with the ambulance. a dignified air, despite the unnatural darkness of her hair. my walls—in my defense, it’s the sort of thing that students expect. that surrounded the Palais du Belle France, where we were all gathered. France had been Gestapo headquarters for the area during the Vichy years. “Whatever Madame Schiafino might say, it is better to ’ave the police. the authority that his presence at the Palais allowed. “If you think so, Gerard,” was Madelaine Schiafino’s polite yet curt reply. these two: they didn’t like each other, and they weren’t new to the emotion. Italian baritone made Chuck Damcott’s high register sound positively nasal. that bored into your very soul. Well, they bored into mine, anyway. so with all the coquettish charm that a woman in her nineties could muster. to women of all ages batting their eyelashes at him. “Tsst! The swimming pool . . .” Madelaine hissed angrily at the American. to start now that he was gone. It was best to say nothing. without seeing his florid face ever again. whole second. I’d closed my eyes, hoping I was imagining the whole thing. paper at an international symposium is a Big Deal. “How jolly nice. Jolly nice,” had been his irritatingly patronizing reply. which no longer seemed refreshing but necessary. Nice was all about him. Again, typical. “I leave on Tuesday,” I said before I could stop myself. “Ah, so you’ll have the whole weekend with us . . . Marvellous! Not if I can help it, I thought. as unexpectedly as he’d arrived. As he was blathering on I’d been trying to think up any excuse to not go. a cab. That’s how I came to be on the spot when Alistair Townsend died. there, I’ll call it ironic, because I don’t believe in Fate. left arm. She looked ashen as he helped her to a seat. “I, also, am not very well,” the old man stated somewhat feebly. “poison.” I did a quick mental review of what we’d consumed that evening. panic grow in the pit of my stomach—at least, I hoped that was what it was. have all been poisoned.” I hated to hear my own fears spoken aloud. in some sort of mass hysteria, or if I was really experiencing palpitations. probably all been poisoned—where was the woman’s sense of priorities? I felt very annoyed and quite frustrated, but fine. of my life being in immediate danger. So, the good news came first. Then came the inevitable bad news. toxin had, in all likelihood, killed our host. I could have told them that! to attend the police station the next morning at 11:00 am for an interview. to start a long weekend in the south of France! might have seen being poisoned and becoming a murder suspect as high spots. to worry about what poison I might have been served at dinner. Not easy. would be the one to talk to at a time like this. Vancouver, across Canada, and internationally. All very hush, hush. me gain some perspective. But calling him would have to wait. break the rules, if at all possible. resigned myself to reliving the events that had brought me to this situation. south of France. I mean—who wouldn’t? good nap and a bit of a wash and brush up, that is. Frank’s fault. At last—I had someone to blame! I was back to Alistair again. more of an “I’ll find someone else to stab you in the back” type of operator. he would be immortalized in print. I shuddered at the thought. poisoner, or of an accidental one? Had we breathed in the toxin? Eaten it? Drunk it? Touched it? There’d been ample opportunity for all those alternatives. And he’d said nothing. Maybe they didn’t know. Yet. we were all exposed to the same toxin by accident. a science. Why people do what they do is what fascinates and drives me. thirty seconds they take on all those tv shows. Sometimes they take days. me, or the rest of group. information. If so, why would he do that? To keep us all off guard, I suspect. until I could talk to anyone I knew or trusted. Bugger! and the way that I teach my students to do it. against it; there could be dozens of other residents who didn’t like the idea. dinner, at least, not within my hearing. Or had they? that had happened that evening, in detail. Maybe I’d missed some clues. I can do it, nor do I mention it at all if I can avoid it. in life they wish they could forget), but it can be useful. If used with care. know nothing does alarm me! fallen away. I could do my thing in private. feelings at the time . . . I would go back . . . This excerpt was provided by the publisher. The tea is all mine, mine, mine. You can find other posts by Cathy Ace here.